Is your Wi-Fi running slower than normal? It could be because someone is using your LAN (local area network) when they should not be. There are several ways you can check this. First way - Check all the device MAC addresses on your network - any you cannot account for indicate a nefarious, rogue device! A MAC address, media access control address, is an alphanumeric identifier unique to each device, as opposed to an IP address which can vary in its assignment to each device. The 54-27-1E-97-E9-33 is the MAC address. If any of the devices located on this list are not one of your devices, then quite possibly you have someone connecting to your Wi Fi when they should not be. "If you suspect someone is stealing your Wi-Fi, it’s a good idea to beef up security (penalties for Wi-Fi theft vary greatly, so consult local law enforcement for follow-up). If you don’t have a password on your network, add one. If you still use the default router name and password, change it — you can do this from the admin page on your router. To change your password, look for the pre-shared key in your security settings. Changing your wireless password will kick off all current devices (including those unwanted freeloaders), so you’ll have to reconnect your devices once you have a new password. 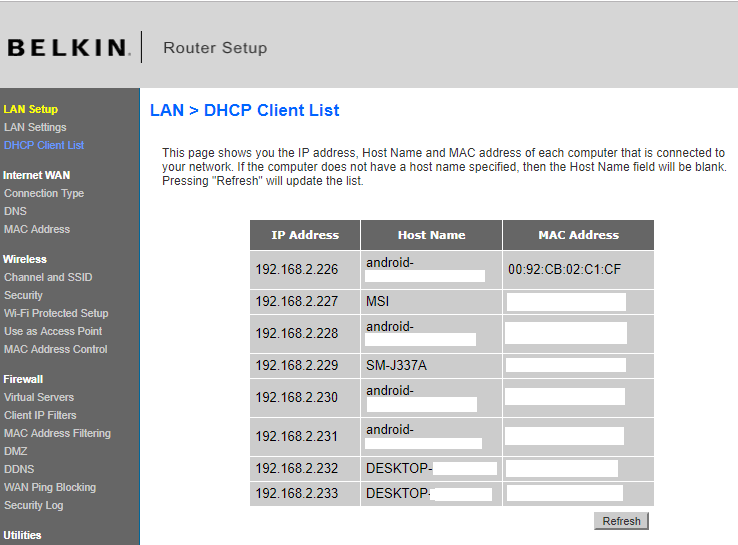 To change your router name, locate the Service Set Identifier. This is typically found in the wireless settings menu. Lastly, it’s important to use the strongest wireless network encryption available for consumers. At this time, that’s WPA2, but it will soon be supplanted bt a new standard, WPA3. If your router was manufactured prior to 2006, it may not be compatible with WPA2 encryption. If that’s the case, you may want to think about getting a new one." "A number of apps are available to provide automatic searches for unusual devices logged into your Wi-Fi network. Checking those devices, especially if they’re connecting at odd times of day when no friends are over, can provide valuable clues. Here are a few apps that can help you pinpoint problems. Paessler PRTG Router Monitoring: Paessler’s solution is a full suite of router management tools, including automatic detection of strange traffic, analysis of how the network is being used, and other in-depth tools. It may be a bit much for the average homeowner worried about their neighbors, but it’s an excellent tool for small businesses concerned about someone hopping on their network without permission. We suggest you stick with the 30-day free trial, which should be enough to root out any problems. F-Secure Router Checker: F-Secure is a web-based tool that is useful if you want to avoid any downloads. This tool checks for more serious hacking — specifically, it looks for signs that someone is using stealthy setting tweaks to hijack your internet, which may be useful for tougher cases. Wireless Network Watcher: This independent software is designed to help Windows and MacOS users watch for suspicious wireless activity and monitor all currently connected devices. Fing: Fing is an iOS download for more mobile-oriented protection. It allows you to immediately see connected devices, what type of devices they are, and the nature of their connection, MAC address, and so on. You can also check Wi-Fi connection behavior to note particularly busy times that could indicate someone else is hopping onto your network."